1. Do you know what a Tastevin (or tâtevin) is? You may have seen sommeliers in Europe wearing one around their neck on a chain. It is the tasting cup used by tasters and wine producers. This silver cup is concaved and faceted, allowing winemakers back in the days of candlelight to catch as much of the light as possible to evaluate the wine. It is also used to appreciate the color of the wines, especially the reds, and to test the quality and clarity of the wine, to see if it is ready to drink. 2. The word “sommelier” is a old French word meaning butler or an officer in charge of provisions, derived from the Old Provençal saumalier, or pack-animal driver. 3. “Cheers!” we say, as we clink glasses with our friends and family. This ritual started back in the Middle Ages, when poisoning was a favorite way to get rid of an enemy. To be sure their glass was poison-free, drinkers would first pour a bit of wine into each other’s glass, so if there was poison in one, it was now in both. But soon, people in the company of trusted companions would pass over the tasting and just clink their glasses instead. Although there’s no real proof to this story, historians speculate that this custom is why “To your health” is a favorite saying along with the glasses clinking. Others say that the noise of the glasses clinking together was meant to dispel evil spirits. Either way, it’s a nice way to start a meal or event. 4. 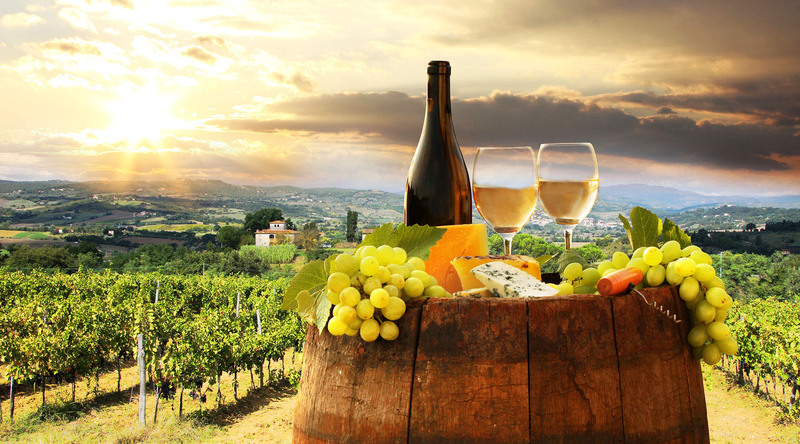 The French didn’t invent wine; in fact, the oldest known wine making was in Iran back in the Neolithic period. These Zagros mountain villagers were making and storing wine around 5400 B.C. in some of the earliest pottery jars archeologists have found. The Nile Delta established a royal winemaking industry around 3000 B.C., with the Pharaohs of Egypt enjoying wine so much that they took thousands of liters of wine into their tombs with them. 5. Romans were wine drinkers too, and we know this for a fact because a bottle of wine was found near the town of Speyer, Germany, buried in the tomb of a Roman noble. It is thought to be the world’s oldest bottle of wine, and itdates back to A.D. 325. It was discovered in 1867, and is currently on display at the town’s Historisches Museum der Pfalz. 6. Where could you find the largest consumption of wine per capita in the world? California’s Napa Valley? France? Italy? Well, almost. The Vatican is the winner. According to the Wine Institute, more wine is drunk per person in the Vatican City than in any other country in the world. Not only is there the regular consumption of ceremonial Communion wine, the Vatican’s residents are also more likely to be elderly, male, highly educated and eat in large groups—and these are all factors that indicate a propensity for greater wine consumption. 7. China has become the leading market for red wine—not just for its flavor. It’s a color favored by the government, and also is considered lucky. 8. Did you know that it takes three types of grapes to make Champagne? It does! It takes two reds, a Pinot Noir and a Pinot Meunier; and one white, a Chardonnay. The color of a Champagne comes from the pressing, when winemakers decide how much of the grape skin’s pigments to color the wine. 9. According to a new study from the Rockefeller University, an average person can recognize about 1 trillion different smells—much higher than the widely quoted estimate of 10,000 smells. 10. Red wine is good for you. Don’t believe me? How about believing a study from Queen Mary & Westfield University in London, that showed how red wine tannins contain procyanidins, flavonoids that against heart disease. But not every wine is procyanidin equal. It turns out that wines from the island of Sardinia and those from the southwest of France have more of these procyanidins than wines from other regions and countries, so look for those on your store’s shelves. Keep these facts handy at your next dinner party, and you’ll be sure to wow your friends. But on the ship, it was our sommelier who wowed us with his vast wine knowledge. Each course was perfectly paired with the wine selection—many thanks to Executive Chef Fabio D'Agosta, and our sommelier, Darko Lilic, for such a wonderful experience! Thank you to our host, Tomasz for the gracious dinner invite and the delightful dinner conversation.